The American Academy recently awarded genre-hopping director Ang Lee the Best Director prize for Life of Pi (2012), and it was well-deserved; Yann Martel’s prize-winning novel, long-thought unfilmable, has been brought to life superbly in a visual masterpiece that won’t soon be outdone. The tale begins with an avid writer (Rafe Spall) whom, upon hearing of a story so incredible it will “make him believe in God”, travels to Montreal to talk with Piscine Molitor ‘Pi’ Patel (Irrfan Khan). Beginning with his upbringing in Pondicherry, India, Pi recounts his days grappling with different religions and meeting the girl of his dreams. When Pi’s (acclaimed and assured débutante Suraj Sharma, in the protagonist’s youth) father decides to move the family to Canada to sell their zoo animals, a fierce storm sinks their Japanese freighter, killing his family. Managing to escape on a lifeboat with a few animals – including a formidable Bengal tiger – over 227 days Pi’s beliefs about God and faith are tested. Thus, the stage is set for Pi’s life-changing battle for survival. As you might expect, proceedings do drag a little at times, but for the most part David Magee’s screenplay is assured. As you may well expect, religion is a major theme in Lee’s latest, but thankfully the film never feels preachy, instead allowing audiences to make up their own minds. Life of Pi took four years to make, and it shows. The eye-catching visuals are evident right from the opening frame, and there are some beautiful, spectacular moments – an encounter with a whale in a bioluminescent ocean comes to mind – that will live long in the memory. In this regard, the work on Pi‘s animal menagerie is an exceptional feat; the tiger is a mix between four tigers and CGI, but the switches between them are so seamless you barely notice. Indeed, when talking of recent cinematic accomplishments, Lee’s boy-at-sea yarn has more than earned itself a place at the table of discussion. When you distil a movie like this down to its core elements – in this case, a man stranded at sea on a boat with a tiger – the central performance becomes that much more significant. Crucially, in his first ever role, Sharma rises to the challenge magnificently, all the more impressive when you factor in the amount of CGI that the debutant has to interact with. 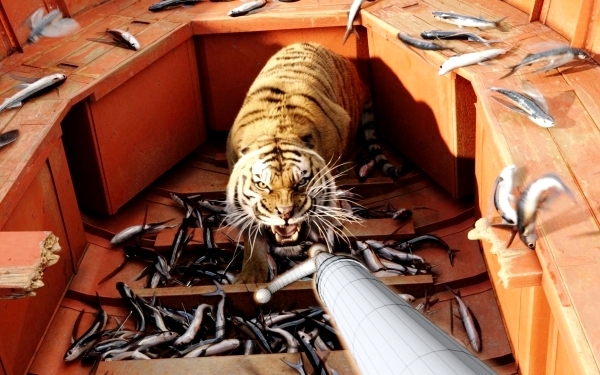 Life of Pi is one of those rare films that’s best viewed at a 3D-capable cinema. Though that time has passed for film-lovers, the compelling narrative combined with phenomenal visual effects make this a film that is well worth revisiting at home. Win a Blu-ray copy of Ang Lee’s Life of Pi with our latest competition. Follow this link to enter.